Emily gave me and my family an amazing gift. Photos are my greatest joy and greatest treasure and what Emily gave me in the photos she took is something I cannot properly express. She was so patient with both my son and my dog that she was able to wait for those special moments. We were not limited by time as Emily was never looking at her watch or anything, so there was no pressure and that really allowed for us to have some of the sweetest and most amazing pictures of my two special guys. She put us all at ease. I honestly get so much joy every day because I have the photos all around my house and its impossible to not smile when I see them. The photos are vibrant and just so full of happiness that they are my most prized possession and without a doubt Emily will have to capture all my family milestones. My son & I had an amazing experience with Emily DeWan Photography. 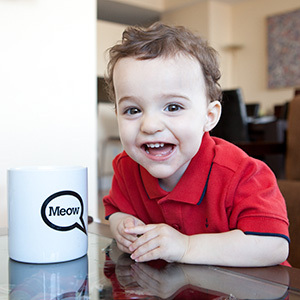 My 2-year-old son Alex was the subject, along with our two cats Sammy & Mia. I was nervous about how we would wrangle my unpredictable toddler along with two uncooperative cats. However, Emily’s easy-going personality made Alex feel comfortable right away, and she even helped me chase the two cats around the house so we could get them in the photos. The images are astounding, and I’m so glad she was able to visit our home to get these remarkable photographs. 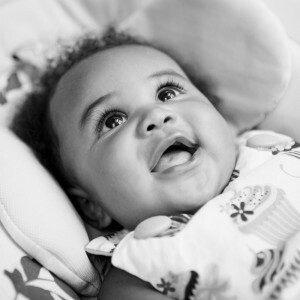 Emily captured the energy and limitless expressions of my son, and a smile comes to my face every time I look at the pictures. One of the things I appreciated above everything is Emily’s clear passion for her work — it’s not just a job, but something she enjoys every day. We have already scheduled another photo shoot with her, now that our family has grown! Emily came to our home to work with my two children and our awesome other family member, our dog Keagan. We had a great time. It flew by as Emily was easy going and made my kids and dog super comfortable to be who they are rather than direct them uncomfortably to pose awkwardly. I would recommend her to anyone. It was most magical how she included Keagan as an absolute equal. Her way with showcasing our love and connection to him was RARE for a photographer. 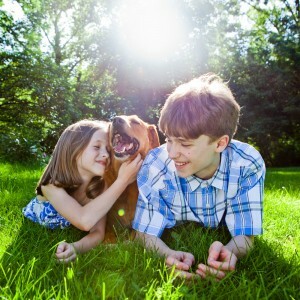 If you love your pet like a family member and want to translate that in forever photos than Emily is the one you want! Emily made my sons and I feel instantly comfortable on the day of the shoot. She arrived exactly when she said she would and rather than it being a stressful, posed photo shoot, she made it fun and actually created a wonderful family experience that none of us will forget! Not only did she capture my children’s unique personalities, she even managed to capture our turtle’s unique personality (yes turtles have personalities!). In fact, upon seeing the pictures, someone commented that our turtled looked, “delightful mischievous” which she most definitely is. To me the images capture a moment in time. 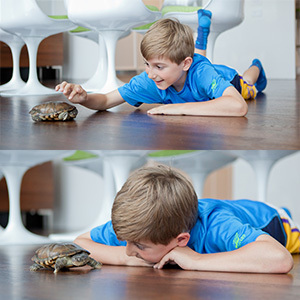 A time when my sons’ are old enough to be their own people with their own personalties but young enough to find pure joy from sitting on the kitchen floor holding their pet turtle. I have become one of those people that whips out pictures of my “family” (which includes our turtle of course!) all the time without being asked. Emily made me, my son and my cats feel right at ease. 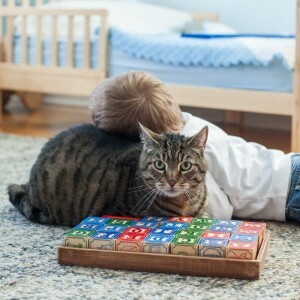 It was a lot of fun and I could tell my son and cats were comfortable and at ease because they got into the picture-taking right away. You can tell just by looking at the pictures that they’re having fun. My son is a ham so I figured he’d enjoy it, but it’s virtually impossible to get pictures of him and the cats together. These photos are amazing! They looked real, but beautiful-real. They capture authentic moments and feelings, but highlight the best of those moments. Having photos like these lets us capture those memories of what life is like now: living with three cats and a baby. These pictures preserve memories that we’ll cherish forever. My family has hired Emily twice to take pictures of our beautiful baby daughter. Emily’s photos are incredible and a million times better than anything we have taken with our various cameras (even good ones). We tell everyone that it was the best money we have spent in capturing the beauty and personality of our baby girl. We recommend her unequivocally. Emily is tops! Over the years, I’d seen her work from a number of friends’ weddings, and without exception was continually amazed. When it came time to find a photographer for our own wedding, there was hardly any question. We were, of course, not disappointed. Everything from the planning stage to the experience of the wedding day, to the wedding photo webpage, was professional. Emily took all of our crazy, fickle direction without batting an eye — but also made her expectations and opinions clear as well, which helped guide us and put our minds at ease as we stressed over the details (and the prospect of subjecting the hired guns to our wacky families). Her greatest strength is in her candids — as another review said, each one really does manage to tell a story. And when it came time to do portraits, she was a machine, managing to corral our enormous families (an amazing feat) and getting great shot after great shot, all with a smile. We’ve gotten so many compliments from friends and family on the final photos. More “best pictures I’ve ever seen” than I can count. Of all of the professional pieces that were involved in putting this wedding together, the photography was the least stressful, and gave some of the greatest results. We’ll treasure these forever.